What: At the Transhumanism and Spirituality Conference 2010, we will explore the intersection of religion, science, spirituality and technology, from a transhumanist perspective. Transhumanism advocates the ethical use of technology to expand human capacities, and observes that if our rapid technological evolution continues to accelerate then humanity will become a new species before the end of the 21st century. Who: Keynote speakers for the conference include former director of the World Transhumanist Association, James Hughes; author of the Transhumanist Manifesto, Max More; and renowned LDS scholar and author, Terryl Givens. Sponsors of the conference are the Mormon Transhumanist Association and the Transhumanist Alliance of Utah. How: Register online (http://transhumanism-spirituality.org) for a discount and reserved seating! Online registration is $50 ($25 for students) until 29 September. Registration on the day of the conference will be $80. Students with ID will be admitted to the conference free of charge, as space permits. Students wishing reserved seating are encouraged to register at the discounted student rate. Two weeks passed due, but better late than never. I think this lesson is quite poorly named. Our Heavenly Family. I don’t think it summarizes very well the material inside. Or put another way, I don’t think the material inside really addresses our Heavenly Family. Arguably half of the lesson is about that (the other half is about the Council in Heaven, which I think would probably be a better title), but even the half about our Heavenly Family isn’t really about that. The most glaring problem is that the text never uses the word Mother – as in, the Heavenly Mother. Her lack is even more glaring because the text relies both explicitly and implicitly on Her existence. Explicitly in the Joseph F. Smith quote, which is from a Proclamation by the First Presidency, where it talks about heavenly parents. One of those parents is presumably the Father that is mentioned repeated. Presumably the other parent is the Mother. She is mentioned exactly zero times. The text relies upon her existence again in discussing the gendered nature of pre-mortal spirits – male and female – who are the sons and daughters of – again the term is used - heavenly parents. But again, no reference to the other parent. To the degree this lesson is to teach us about our Heavenly Family, the picture represents a single-parent home. Given the Church’s emphasis on both our families here on earth and our eternal families in the future, I remain somewhat bewildered by Her lack. The first recorded reference to a Mother in Heaven is from 1839, when Joseph Smith taught it to Zina Huntington, telling her that in addition to seeing her deceased mother again some day she would also meet again her “eternal Mother, the wife of [her] Father in Heaven”. In 1844, W.W. Phelps wrote a hymn for the dedication of the Seventies Hall in Nauvoo that includes the lines “Come to me; here’s the myst’ry that man hath not seen; Here’s our Father in heaven, and Mother, the Queen;”. This hymn was included in LDS hymnbooks until the 1948 revision. One year later Eliza R. Snow wrote the well known “Oh, My Father” (originally entitled “My Father in Heaven”, and also sometimes “Invocation, or The Eternal Father and Mother”) which includes both the line “Truth is reason; truth eternal; Tells me I’ve a mother there” and then invokes both Father and Mother in imploring “When I lay this mortal by, Father, Mother, may I meet you in your royal courts on high?”. Eliza said that Joseph taught her the doctrine and President Wilford Woodruff declared the hymn a revelation. The Heavenly Mother would be reference occasionally in subsequent years, including in two Proclamations; the one referenced about in 1909 and in the 1995 Proclamation on the Family. President Hinckley opined in 1991 that the doctrine of a Mother in Heaven sits well with him. On the one hand what strikes me is that 171 years (at a minimum) after Joseph Smith first re-revealed Her existence, we remain without any formal knowledge of Her. We even seem to be unable or unwilling to actually acknowledge Her – despite doing so. By acknowledge, I mean actually use the words Heavenly Mother. If we’re going to produce a lesson entitled Our Heavenly Family, include a reference to heavenly parents, why are we unwilling to actually say the words “Heavenly Mother” - particularly when our first prophet was able to do so. We seem fine with relying on Her for our theology, just not with including Her in our theology. As I said, I find it somewhat bewildering, and the choice of titles for the lesson emphasizes the lack to me. Before addressing two other items that stuck out to me in the first half, I want to emphasize that I believe that the pre-mortal existence idea, the Council in Heaven, and the “children/family of God” ideas are deeply important and meaningful to me. So when I raise the questions below, it is within that context. First, on the pre-mortal existence and the veil of forgetfulness. If I existed in the pre-mortal realm in a manner similar to, if not exactly like, the way I exist now – meaning I was clearly me, others of you were clearly you, we were clearly individuals, and we had existence, relationships, history, etc. – and existed for eons of time; and if when I came into this world with veil that blocks out that existence, how should I understand that life and this life and the next life. Meaning, when we die, or in the spirit world, or at the resurrection (the time doesn’t matter, just the action), will the veil be removed at some point? Will I remember eons of existence before this life? The manual says God remembers who we were, so will we? If the answer is no, then am I really that person in any meaningful way? Would we not say that that person spiritually died at my birth, never to live again? Or that I am not really that person? Indeed, the veil begs the question of whether I’m really that person anyway. Sure, my talents, abilities, nature, etc., might come from that person, but if I don’t remember that person, am I me? If I suddenly got amnesia, would I still be me? At least in that case, I’d still have those around me who remember. But in the case of the veil, you’ve all forgotten too. Yet if the answer is yes, then am I really the person I am now. If I existed for hundreds, thousand, millions, billions – whatever number doesn’t matter – years before this life, and if at some point I will remember all those years – am I really me, the temporally existing person who has been alive for a few decades? Certainly my relationships with my parents, siblings, wife, children, and friends are all deeply meaningful – I cherish them more than anything. They are my sweetest relationships and most cherished memories and my greatest hopes for the future. But who did I love, cherish, enjoy the company of in the pre-mortal world. Will not this life seem like a passing dream in comparison? Either way, the dis-continuity of identity is troubling. Brigham Young taught that salvation was the maintaining of identity. If we lost our identities when we came to earth, we’re we being damned? And if we get back those identities at some point, how will they united/meld with the identities that I’ve forged here. I don’t know the answer to these questions – but it does seem to me that there may be much more importance to getting these bodies than we give them credit for. Perhaps we were not nearly so “real”, or as “organized”, or as “free” as we are now). None of those are the right words, but perhaps my sense will come through. (Joseph taught at one point that pre-mortal spirits with more power bore down on those with lesser power, implying perhaps that our bodies here help to “even the playing field” or somehow provide help to weaker spirits). Because if that life is essentially the same as this, except that my body was purer and finer, than I’m not sure how the century at best we can spend here can influence our natures/personalities in any degree of comparison with the time implied by a pre-mortal life. Finally, on spirit birth. In the King Follett discourse, Joseph’s last General Conference talk (and/or the subsequent Sermon in the Grove, his last sermon ever - I can’t recall which one) taught two important ideas. That which has a beginning also has an end, and that we, as spirits, are co-eternal with God. The latter idea specifically is supported by a number of scriptures, including D&C 93 and Abraham 3. He seems to teach that we are eternal beings. Yet we also teach that we a spirit children of God. I think the most common understanding is the B.H. Roberts synthesis, which is the tripartite model of intelligence, spirit, body. We were eternal intelligences, we were born as spirits and then we were born as physical people. Some believe the intelligences had individual identities (the original “you”, so to speak), while others maintain that intelligence is the eternal spiritual building blocks from which God created spirit bodies. I wonder though, if Joseph didn’t literal mean that our spirits were eternal, and if D&C 93, when it says “in the beginning with God”, does not also mean “eternally, just like God”. And if our “birth” to our Heavenly Parents was not more akin to our “birth” as children of Christ, as referred to in King Benjamin’s sermon. To tie us back to the start of my post, this could of course be a way to get rid of Heavenly Mother, and say that Heavenly Father “adopted” us eternally existing spirits all by Himself (I know a number of Mormon thinkers who think this way). In sum, I find the lack of acknowledgement and formal teaching about a Mother in Heaven puzzling within the church as a whole and within the lesson specifically. I believe we are eternal and existed before this life, but I’m not sure what all the implications of that belief are, and I don’t know what it means to have eternal existence, to be born spiritually. Most of all, it’s probably a good think I don’t write these manuals. But the gospel has lots of food for thought. And I didn't even talk about foreordination, the Council in Heaven, or the plan of salvation. This is the first of what I hope will be a series of posts on the book Gospel Principles. It is not a lesson guide, but my thoughts on the lesson in question. This lesson has 3 main points. Point one's basic message appears to be a) there is a God, which we know because the world exists; b) God lives in Heaven and created the Earth through His Son (I have to admit that the way the text is written leaves the strong impression that the Son is not God, which is unfortunate given that the primary message of the Books of Mormon is that the Son is God.... I'm going to resist the urge to look ahead and just wait till we get to that section); and c) God, the Ruler of the Universe, is the being we worship. As we have just started to study the Old Testament in Gospel Doctrine, I'm struck by how "modern" point one is. It presents one side of an either-or proposition. Either there is a God or there is not and taking the position that there is. It is interesting because so much of the Old Testament is written not within the context of "is there or is there not a God", but the active affirmation that Yahweh/Jehovah is the God of the whole earth. Indeed, in its current form it argues that Jehovah is the only God, though one can still see clear undercurrents of Israel's early polytheism, including Jehovah's one-time position as the god that El, the Most High God, had appointed as god of the nation of Israel (and the idea that the other 70 nations were appointed other gods), to the merging of El and Jehovah, and to the elimination of other gods from 'godhood'. The main point being, as we see with Moses in Egypt, with Elijah and the priests of Baal, with the various invasions from Assyria and Babylon, the testimony that Jehovah is God. Not Baal, not Amon-Ra, not Ahura Mazda, not any of the gods of the Gentiles. Interestingly enough, however, while most of the Book of Mormon covers an "Old Testament" timeline, it does not really contain that concern - the concern that Jehovah or Christ (given its Christocentric nature) be recognized as the God - but rather reflect the more modern concern about whether there is or is not a God at all. Granted, this is not entirely true - part of the question is whether or not Christ is God. There is not, however, the suggestion anywhere I can think of that their might be another gods other than Jehovah or Christ who might be worthy of worship. And one is left to wonder why, though I can think of at least 3 possible ones of the top of my head. It is interesting to consider how much changed via the adoption of Christianity by the late Roman Empire, the abolishment of paganism by Imperial dictate, and the successful if frequently forced conversion of European pagans over the course of a little over 1000 years (I recently re-read a book on the Conversion of Europe from 350-750 AD). The Roman, Greek, Egyptian, Nordic, Slavic, Celtic gods were almost entirely erased. And Islam managed to get rid of North African, Arabic, and Persia gods as well (despite the tenacity of Ahura Mazda). The Hindu, Chinese, and Japanese gods remain, but the dominance of the West means that we don't actually take their gods as serious rivals for our God. Islam and Judaism both being considered followers of the same god as Christianity (at least, part of the same god). Point 2 is interesting. It contains three basic ideas as well. These are a) God has a body like ours in form but unlike ours in that it is perfect and glorious; b) God is perfect, embodying a variety of good virtues, having all power, all knowledge, and being full of goodness; and c) all good things come from God and that everything he does is for our salvation and exaltation. This section returns my mind to the question of what type of -theism is Mormonism. Christianity ran afoul of both its Judaism before it and Islam after it. It claimed to be a monotheism, but both the Jews and the Muslims accused it of being polytheistic. Indeed, Father, Son, and Holy Ghost does become problematic if you are going to ascribe godhood to each of them. The Christian answer became the Trinity - three-in-one. It's looks like polytheism but it's really monotheism. The first few church councils, the first major schisms, and much mutual accusation of heresy came out of the debates on whether Jesus was god, man, both, fully both, etc. Most Mormons prefer to think of themselves as monotheists, if only because polytheists sounds like a dirty word. We clearly believe each of the three members of the Godhead to be separate beings. We have some vague idea about there being a Mother in Heaven who maybe makes a fourth god(dess). We've got our whole notion of exaltation. And we've got Joseph Smith boldly proclaiming that he and the Elders of the church have been teaching a plurality of Gods since the beginning. Of course, this is also contrasted with the Book of Mormon's simple statement that the Father, Son, and Holy Ghost are one God. And as we normally put it, they might be separate, but their perfectly united, so they are one. Therefore, we're monotheists. Some Mormons have suggested Max Muller's term henotheism, which is the worship of one god while acknowledging the possibility that other gods might exist. However, Muller's idea was explicitly created for equality; the humble sense that "I worship my god, but I accept that the god that you worship may actually exist and be worthy of worship". Julius Wellhausen first used the term monolatry, which is the worship of one god while recognizing (actually or potentially) the existence of other gods who are not worthy of worship. This term has been used to describe early Israelite beliefs, as I referenced above. This one almost works for Mormons, except that we typically say we're fine with worship Christ too (though not praying to him; and this despite examples of prayers to Christ in the Book of Mormon; I don't know if an LDS leader has ever commenting on worshipping the Holy Ghost). Karl Krause coined the term panentheism, which takes the idea of pantheism (that everything in the Universe together makes up God, or the Whole is God) and flips its slightly to say that Gos is in, but more than, the whole). Thus God includes the whole of the Universe, but is greater than or transcends the whole. While this term is not perfect, it begins to feel a bit better to me. It does allow that God can be more than a single entity - God could be the Father, the Son, and the Holy Ghost, as well as all of creation - but it still doesn't seem enough. Since I don't actually know Greek and don't plan on trying to coin a new term, I have decided that Mormon theology - at least, The Ignorant Sage's version of Mormon theology - can best be described as a pluralistic monotheism. In essence, God is an group of beings who together form a single Godhead or Godhood, or as the Book of Abraham has it, the Gods. The Father, Son, and Holy Ghost, as Joseph Smith and Brigham Young taught, form the Presidency of the Gods. Put another way, the Father is God, the Son is God, the Holy Ghost is God, and the Gods are God, and they are One God. I just don't think it is right to call that Monotheism. Point 3 is about coming to know God, including the classic verse that to know the only true God and his Son Jesus Christ is eternal life. It recommends the classic Sunday School answers of pray, study the scriptures, and keep the commandments as the method by which we do this, as well as the start point of believe in God's existence and his love for us. And since I don't have any more time, I'm just going to have to leave this post with the idea that all of those things are definitely good things to do. Have an enjoyable Priesthood or Relief Society Meeting. Today is Rememberance Day. It commemerates the armistice signed between the Allied powers and Germany to end hostilities on the Western front of the First World War. The armistice came into effect on "the eleventh hour of the eleventh day of the eleventh month" and so, each year at that time we (in Canada, the UK, Australia, New Zealand, and South Africa) observe two minutes of silence to remember those who have died in war. 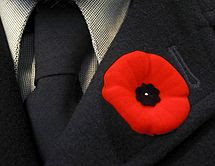 From November 1 to November 11, many of us will wear a poppy as part of our rememberance. This tradition comes from a poem, written by a Canadian physician, Lieutenant Colonel John McCrae, entitled "In Flanders Fields". The flowers grow there in fields that saw many of the worst battles of the First World War and their blood-red colour makes them an apt symbol of rememberance for those who have fallen. In Canada, this poem is always read during our Rememberance Day services, such as those I attended on occasion at the Legion Hall back in my home town. It is a powerful and touching poem. The poem became even more powerful to me when I learned, as a teenager, that my great-uncle, my paternal grandfather's older brother, died in Flanders fields. My grandfather immigrated to Canada from Germany between the two wars and my great-uncle died in Flanders fields fighting in the German Imperial Army. Learning this was the first time that the reality of war truly hit home. Not because I knew my great-uncle (obviously), but because it is so easy, when we think of wars, to think of our forces as "the good guys" and the enemies' forces as "the bad guys". But was my great-uncle a "bad guy"? I did not know him, but I knew his brother - my grandfather - perhaps one of the greatest, and humblest, men I have ever been priviledge to know. When I learned this story, it taught me to remember something bigger on Rememberance Day than those who have died for my country. Rather, to remember the noble tragedy that is war. That those who died did so while fighting their brothers. That whenever we go to war, even when our cause is just, we go to war against our brothers and sisters. Protecting our brothers and sisters in our country is noble and we must remember those who gave their lives to do so. But their is no escaping the tragic reality that they are protecting us from people who are also our brothers, and killing and being killed to do so. Soldiers from my country are currently killing and being killed in Afghanistan. Soldiers from my wife's country are there too, as well as in Iraq. We should stand by them, and for those who fall we must always remember them. But as we shed our tears for them, let us also shed a tear for those, our brothers and sisters, who fall in fields without poppies or poems, who are now our "enemies", but are still our family. Tonight was mine and Jennifer's eleventh wedding anniversary. Part of our anniversary celebration was to go to U23D, a 3-D movie of a U2 concert held in Buenos Aries. One of the sets they did was one of my favourites, Sunday Bloody Sunday. During the prior set, Bono had put on a headband that had a crescent moon, a Star of David, and a cross, symbols of the three Abrahamic faiths. 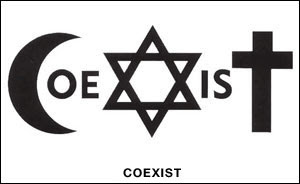 Between the moon and the star were the letters "o" and "e" and between the star and the cross were the letters "i" and "s", turning the three symbols into the word "Coexist". During a segment of the song, Bono sang words addressing Father Abraham, asking "what have we done? ", reflecting the blood shed by members of each faith warring against, amongst, and between themselves. And then the call for "No More!" I was profoundly moved by the song - not a call for the end of religions, but a call for coexistence, for peace, and for love. Literally moved to tears. I reflected upon the words of our earlier prophets, particularly Brigham Young, that in the millenium there would still be people of all faiths on the earth. The difference would be that we would be at peace with each other, that there would be no bloodshed, strife, or contention. I look forward in hope for such a better world. The day after my last post, I was teaching Sunday School. The lesson covered Mosiah 1-3, which includes King Benjamin's initial sermon to his people on the occasion of him passing the crown to his son, Mosiah. In this sermon, he says, "..that with power, the Lord Omnipotent, who reigneth... ". My wife told me that the last post seemed a little too lob-sided, and that the ending insufficient to balance it back. Lincoln's comment online seemed to reconfirm this. Hence the Part II. First, I believe God to be powerful. I believe God to be the Creator of Heaven and Earth. I believe God to be powerful enough to both organize and govern the universe and comfort the distraught heart of a single soul. I believe there is nothing more powerful than God. So why did I post with such emphasis on God's limitations? Frankly, because we don't like to admit that He has any, despite the fact that God's limitations are important - important to our salvation. In the Council in Heaven, Christ and Lucifer offered to become our Saviours - our God. God our Father chose Christ. Lucifer refused to cede the debate, rebelled, and was cast from Heaven. We chose to follow Christ. Many chose to follow Lucifer. In Moses Chapter 4, the Lord quotes Satan as offering to save all mankind - that not one soul should be lost. It’s clear that this is the selling point of Satan’s plan and thus equally clear that inherent in God’s plan is that some will be lost. So let’s be serious. On the face of it, how is this not the better offer? Plan A – some are lost. Plan B – none are lost. A third of the hosts of heaven sided with this idea. So why did God (and the other two-thirds of us) disagree. Now, God doesn't give us the details of Satan's plan – but He does give us the two reasons why He cast Satan down – why his plan was rejected. One reason is because Satan sought to destroy the agency of man. The other reason was rebellion – rebellion in that Satan said that since his plan would save everyone (and God’s plan doesn't), that God should give him his throne. We learn three things from this. First, God is willing to share his power, but not give it up. That sounds almost petty at first glance – I mean, if Satan’s plan were better, wouldn’t ceding the throne be the right thing to do? Clearly, not or God would have done so. So why not? Option one is that the part of Satan’s plan that entails destroying mankind’s’ agency is not doable. That God and/or Satan literally cannot take away mankind’s agency. Essentially, nice idea Satan, but we really can’t do it. And then Satan just doesn’t believe him and rebels anyway. In this case, of course, God is limited. Limited, that is, by His inability to actually accept Satan’s plan. But not so fast, because He still didn’t choose Satan’s plan. He didn’t want to. He chose not to. He made a value judgment and decided that His plan, including some being lost, has an end result that is more valuable than Satan’s plan in which none are lost. As Mormons we are all familiar with the agency thing - the idea expressed repeatedly in scripture in different ways (I think most eloquently in 2 Nephi 2 and D&C 121), that we are to experience opposition and to grow and learn, and that this things we suffer will both be for our good and our exaltation if we bear them well; that we need to learn for ourselves and choose the good and reject the evil. The end result of the process being our progression and eventually our exaltation. It also means He still has a big limitation. Put another way, God either a) couldn’t choose Satan’s plan because it was no within His power to do so, b) didn’t choose Satan’s plan because it was incompatible with His desires. Either way God is limited because the one thing that is clear is He couldn’t choose to both exalt his children and save all of them. I return to where I ended my last post, I believe God is mighty to save. This is the power of God that I care about the most. I believe in the mighty powers of a marvellous God, but I also experience a world in which many people do not. They don’t for a variety of reasons, often involving the suffering and pain in the world, the death and destruction, and/or the God’s hiding – the fact that God is not evident in the same way tangible things like the sun, the moon, mountains, etc. To say that God chooses not to do something about those things to me is equivalent as saying God cannot do something about them. Whether He lacks the power or chooses not to because He has other ends in mind is not the point, because clearly He cannot bring about His ends AND resolve all of our pain, sorrow, suffering, etc. The only other option is that He could do so and just doesn’t care enough about it to worry about it. As I taught in the aforementioned Sunday School class, King Benjamin teaches us quite clearly that God does care. He was willing to come down, make flesh his tabernacle, and suffer the pains of this life to save us. To have his reaching out to us in love be responded to with hate. I believe He would only do so because He both loves us and because doing so was a necessary part of His desired ends. As I said hinted at last time, I believe that in part it is because we have a co-eternal core – our intelligence - that God is seeking to empower and assist to progress. And that progress is something God can only bring about via our own choices, individually and collectively. Becoming one of us, so that we can become one with Him. I don't like the omnis. Not omni-present, not omni-scient, and least of all, omni-potent. I don't believe God to be any of those things - at least not in any traditional sort of way (and possibily not even in untraditional ways). I believe in a God that, while eternal, is also finite, or limited. The key scripture for my dislike is Doctrine and Covenants 93:29, which reads "Man was also in the beginning with God. Intelligence, or the light of truth, was not created or made, neither indeed can be." The idea behind this verse was also taught more explicitly in the King Follett discourse where, in discussing the eternal nature of our souls, Joseph said we were "co-equal" with God. "Co-equal" in the sense that neither we nor God were created, at least in the sense of "from nothing". I believe that you, me, and everyone else have always existed. And that existence has always included some degree of freedom and choice. Now, a freedom and choice that could and can be oppressed and controlled, but nevertheless, at our core we are eternal beings and God respects that. In fact, the verse says that God can't do anything about it, at least in the sense that God cannot make us. Cannot. So much for omni-potent. If you, me, and everyone else have always existed and have always had and still have some degree of freedom, of power of choice, than God is not omni-potent. God does not have all power, because you, me, and everyone else has some power. Either you have power or you don't. The power you have is power that God doesn't have. Put the other way, if God truly has all power, than you have none. Omni-scient I dislike because I fall into the "If God already knows what I'm going to do, I have no choice not to do it" understanding of agency. That's probably best saved for a separate post sometime. But the idea is the same. If I have choice, if a point I really can choose A or B and it is not already determined by my background, upbringing, past choices, etc. - if, for example, I really can choose to repent (or not repent), I really can't see how God can know in advance. I've heard the arguments, I just don't buy them. That and I believe God is progressing. And that I think eternal existence would be profoundly boring if I knew everything. But for another post. Omni-present is the easiest. I believe that God has a body (either flesh and bone or spirit, depending on what member of the Godhead we are talking about), but either way, a body. Which means quite simply if God is here he is not there. Ironically, this is also the one I am most comfortably understanding in non-traditional ways. Doctrine and Covenants 88 talks about the light that radiates from God to fill the immensity of space. I don't take issue with God having impact, influence, awareness, etc., thoughout the universe. I just think if we, as Mormons, are going to believe God has a body we should keep terms like "everywhere present". God is present where God is. At its core, I believe God is part of the universe. While I believe in God as the Creator, I do not believe God to be the creator of the universe. Not in the "ex nihilo" fashion, from nothing. Me, you, God, matter, spirit, etc., have always existed. As Joseph phrased it once, "God, finding himself among...". God found himself in a universe. God then set about "creating it". Organizing the chaos. I happen to believe that the "ex nihilo" doctrine is one of the worse doctrines ever developed; an idea ripe with destructive potential. God is a great craftsman. An artist. He is working with us to make the universe, including us, a better place. He calls us to be craftsmen an artists with Him. I do not believe that He is all-powerful, but I do believe, as the scriptures phrase it, that He is mighty to save (D&C 133:47). And that, in the end, is what is important to me.